Doctor Who has been going so long now that there can be few alive that don’t have a favourite Doctor. Those of us of a certain age will specially remember Tom Baker's stories which spanned 1974 – 1981. Fan and semi-professional projects have seemingly thrived in the Doctor Who universe producing original stories across multiple media platforms, but what of the actors...? Reeltime Pictures was founded in 1984 to produce independent films; however their love of Doctor Who saw them creating the Myth Maker series. Originally distributed on VHS they have now been released as DVD set, split into specific Doctor Who periods. 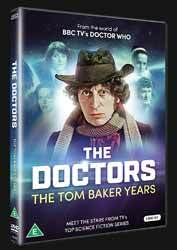 The Doctors: The Tom Baker Years is a two disc DVD collection which covers the lead actor as well as his most significant companions. Overall there is about five hours of material in the set. Collected together, you get the interviews that presenter Nicolas Briggs, famous as the voice of the Daleks, and and long-time Who fan and film producer Keith Barnfather collaborated on those many moons ago. The set opens with the two collaborators looking back on their time making the interviews with some insight into how and why they were made. For some the meat of the piece will be the interview with Tom Baker. Anyone who has read Baker's autobiography – Who on Earth is Tom Baker – will know what a consummate story teller he is, he is also very funny. Tom recounts stories about his life and work as an actor as well as talking about Who, which he seems to have a genuine fondness for. Who is often defined by the relationship that the Doctor has with his companions, so while it is great to see these interviews it’s a little sad that many of the actors are no longer alive. Elisabeth Sladen as Sarah Jane Smith, the feisty reporter who was introduced to Baker in his first story ‘Robot’ having already acted with John Pertwee’s Doctor. She was set to be the equal of the Doctor and for a while she was, before lazy writing reduced her to an exposition sponge. Never the less she remained a fan favourite, even reprising her role in her own show. Ian Marter as Harry Sullivan, although a fine actor he was not served that well by the show, being cast often in the damsel in distress role. That said he too has fond memories of the show. Louise Jameson as Leela was introduced as totty for the watching fathers and so was condemned to start her career in little more than a leather bikini. Mary Tamm as Romana stayed a while and was the first long running time lord companion for the Doctor, so I’m not really sure what all the hoo-ha is about Jodie Whittaker playing the Doctor. John Leeson as K9 outlasted many a companion to reappear in the The Sarah Jane Adventures next to Elisabeth Sladen, not bad for what is essentially a voice over job. These are pretty much essential for Who collectors, especially as some of the cast are no longer alive and Tom Baker is usually reluctant to talk about Doctor Who. The segments are presented with an aspect ratio of 4:3. The print is obviously taken from a master as it’s not too bad. The only real issue with these pieces are the production values, outdated music and some ill thought out shots makes this more of a superior set of fan films than a professional piece.